"The hard part is how to make it into something that doesn't feel like a world torn asunder and people just in battle," he described. "I think we really want to focus on the idea of a world that's running well, and then it's Emergence Day and kind of make it impactful and immediate and the survival of those 48 hours as people survive Emergence Day. It's more like Cloverfield or something like that." Not just a "let's make a movie of an insanely popular video game 'cuz we can dammit!" 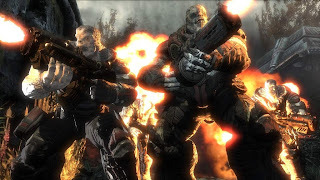 then, but apparently this is going to be a thoughtful and well-considered chapter of the Gears of War canon as much as any of the games or books. Hey, with two-some hours of running time, we're potentially looking at the tail end of the Pendulum Wars, a really good look at Sera (maybe even how the humans came to be there in the first place) and then the horror of Emergence Day and its aftermath. Sounds like full of win to me. Maybe Gears of War will be the movie that finally bucks the trend of video games-to-lackluster movies.